By election day, however, Newark councilwoman Gayle Chaneyfield Jenkins, who had entered the race on January 9, 2018, was Mayor Baraka's only challenger. ^ "News: 2018 Municipal Election Information". www.newarknj.gov. Retrieved 18 January 2018. 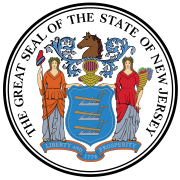 ^ "This fight between politicians could be N.J.'s nastiest of 2018". Retrieved 17 January 2018.